I am a big fan of the Wii. Think of it less as a video game, and more as a family fun center that can replace static board games as an activity the whole family can do, when it’s raining or you just don’t have time for a longer outing. 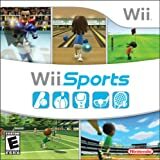 Now there are more and more Wii games that are good for getting a bit of exercise. Notice, I say a bit of exercise. Like a lot of things, you get what you put in, so don’t expect the console to burn off 500 calories for you. But if you get up and get moving, you can easily burn off as many calories as in a walk at moderate pace. Put more into it, using some of the more programmed exercise routings (ie Wii Fit), and you can really see changes in tone and weight (I’ve lost 5 lbs and have more tone where it counts than I have had in a long time). Wii Fit Plus is an extension of the Wii Fit game introduced a few years ago, and has plenty of fun, creative games to play with your kids, including an obstacle course, tightrope walking and snowball fights. Only 2 can play at a time. Wii Sports. This is the classic game that comes packaged with the Wii console in some cases. Here, tennis the big winner, but you’ll have to get out of your chair and swing like crazy to get exercise out of it. Many parents figure out right away that you can swing the controller like a fly swatter from a comfortable chair. Yes, that works. But don’t expect to work up a sweat, or rationalize a big appetite. Raving Rabbids. Uses the Wii Fit balance board to work on coordination of both sides of the body. We Ski. Again, uses the balance board to develop core strength and body coordination. The user can stand or sit. Get Moving Family Fitness from Jumpstart. This series hosted by Brooke Burke starts off a little goofy with her introduction, but the games inside are all fun and can be played by 2 players. They involve components of major sports like passing (basketball and football), setting the ball (volleyball), and running. Be ready for a workout. To compete against your kids, you’ll have to get out of your chair and really move. After 10 minutes, I needed a break and had a little residual soreness from muscles that don’t get used this way very much any more. GreatDad.com Review Policy: Some of the featured products for this review were provided to us, at no cost, by the manufacturer or representing PR agency for the sole purpose of product testing. We do not accept monetary compensation for reviewing or writing about products. We only review products that we have personally tested and used in our own homes, and all opinions expressed are our own. In this case, we purchased all of the items listed above, except for Jumpstart’s Get Moving, which was sent to us for possible review.